Rising immigration enforcement in the U.S. interior over the past decade increased the chances that the estimated 5.3 million children living with unauthorized immigrant parents, the vast majority of them born in the United States, could experience the deportation of a parent. 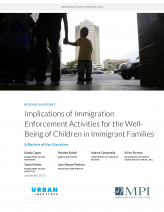 This MPI-Urban Institute report reviews the evidence on the impacts of parental deportation on children, and on their needs for health and social services. The literature mostly dates from a period of peak enforcement: 2009 through 2013, when there were nearly 4 million deportations from the United States. While data on parental removals during this period are limited, perhaps half a million were of parents of U.S.-citizen children. The economic and social instability that generally accompanies unauthorized status is further aggravated for children with a parent’s deportation, with effects including psychological trauma, material hardship, residential instability, family dissolution, increased use of public benefits, and, among boys, aggression. At the extreme end, some families became permanently separated as parents lose custody of or contact with their children.